Two things about me. First, I like always having some event planned for the future so that I have something to look forward to. I have spent more than one plane ride home following a vacation thinking about what my next vacation could be. Second, sometimes I don't learn from my mistakes. Mr. Deep and I returned to Joburg from our two week trip to the U.S. this past Thursday morning. 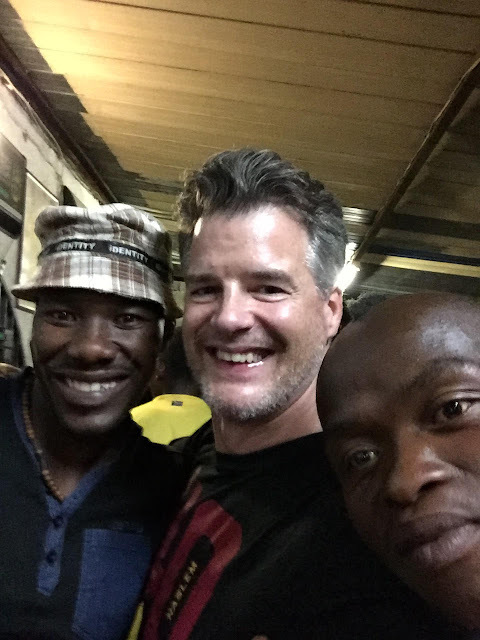 Because I thought it was important that we have an activity to look forward to upon our return, before we left for the U.S., I arranged for us to participate in a shebeen crawl in Soweto on Saturday. The part where I don't learn from my mistakes comes into play because once again we suffered from serious jet lag. I was not able to fall asleep until 3:00 a.m. on Friday morning and both Mr. Deep and I were wide awake between midnight and 2:00 a.m. early Saturday morning. During this two hour period both of us also found it necessary to eat a snack because we felt hungry given it was dinner time back in the U.S. So yes, we were kind of a mess. However, if you are already feeling crappy and not at the top of your game, that might be the perfect time to go on a pub crawl. Shebeen is an Irish word that refers to an illicit club that sells alcohol without a license. Most shebeens are now legal however the shebeen plays a significant role in South African history, which you can read more about here. You might remember I have written about Soweto before as we visited the area when my parents were here. Soweto is the largest township in South Africa and is home to over 1 million people. A township refers to an area where black people were forced to live during apartheid. The shebeen tour was arranged by a group called InterNations in conjunction with a tour company called KDA Travel & Tours. InterNations is the largest international expat community in the world and offers networking events and activities as well as tips and practical information for expats living in over 390 cities worldwide. Mr. Deep and I received a lot of advice from other expats both before and after moving to South Africa suggesting we join expat clubs such as InterNations as a way to meet people. We have been doing pretty well meeting people without joining any clubs but this seemed like a fun event and a good way to meet others who have relocated to Joburg. We met the tour guide and the rest of the group at a hotel in Sandton City and boarded our bus to Soweto. Mr. Deep and I were the only Americans participating. The other expats were from Germany, Italy, Cameroon, Nigeria, Zimbabwe, Finland and the Philippines. There were also three Australians. Not to stereotype but I think Australians really enjoy a good pub crawl. We didn't receive our itinerary in advance, which we were told was for our safety, so until the time we boarded the bus we had no idea what the night would bring. We were not really worried about safety but we did decide to leave our rings and nice jewelry at home prior to departure. Once on the bus, we met our tour guide, Ngugi, pronounced Goo-gee. He assured us that going to Soweto and on the tour was completely safe and that we were in for a great time. He said that since Soweto is so famous and has so much historical significance that people there are used to seeing visitors and tours pass through frequently. He told us our first stop would be to have dinner at a place called Tinties. I don't know who Tintie is but s/he must be doing really well financially because we soon arrived at a small shopping center where every single store had Tintie in the name. There was Tintie's restaurant, Tintie's Supermarket, Tintie's butchery, Tintie's Pool Hall and Tintie's bottle store. The whole parking lot was full of people as were all of the stores and the restaurant. The parking lot looked like a tailgating party that you would see in the U.S. at a sporting event. People were parked and hanging out and just drinking and dancing near their cars. It was not a holiday or a special event, just a typical Saturday evening. There was also a DJ playing music in the corner of the shopping center. We headed to the restaurant where we somehow secured a long table like you would see at a beer garden. I call the restaurant a restaurant but really it was more like a grilling pavilion. 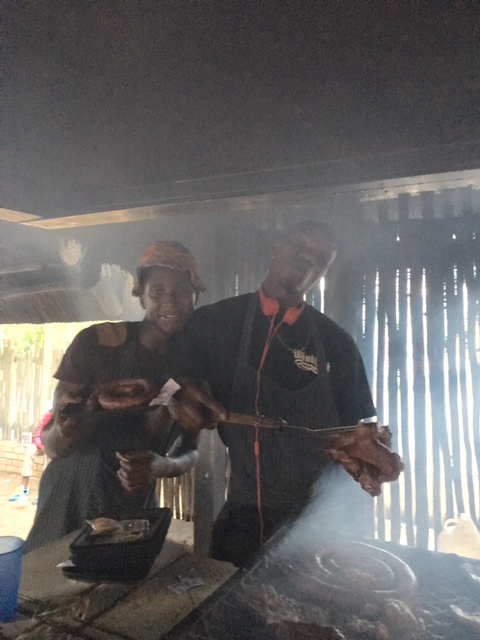 It had a huge braai (grill) and guys were manning the fire and cooking tremendous amounts of meat. In order to have your meat braaied you first had to go and purchase it raw from the butcher. If you wanted beer or a drink (and of course we all did) you had to walk across the parking lot to the bottle store to get it. The bottle store was really more like a stand where the liquor and the seller were safe behind bars. To purchase a drink you had to wait in a line and then tell the guy behind the bars what you wanted. Mostly everyone was drinking beer which were huge quart size bottles. It seems none of the locals in Soweto wanted to waste time with a pint. In addition to buying a bottle quart, you could also buy a whole six pack of regular size beer. Liquor and soft drinks were also sold. In addition to not selling the drinks or the meat, the restaurant did not provide any plates, utensils or napkins (serviettes.) We were expected to eat everything with our hands. That is easy when eating a lamp chop but more difficult when eating the pap and prawn salad. Pap, you might remember from this post, is a staple food of South Africa. It is made from maize meal and is the consistency of mashed potatoes. The pap (pronounced pop) was served with a side of chakalaka sauce which is a very delicious cabbage and tomato sauce with a hint of curry. 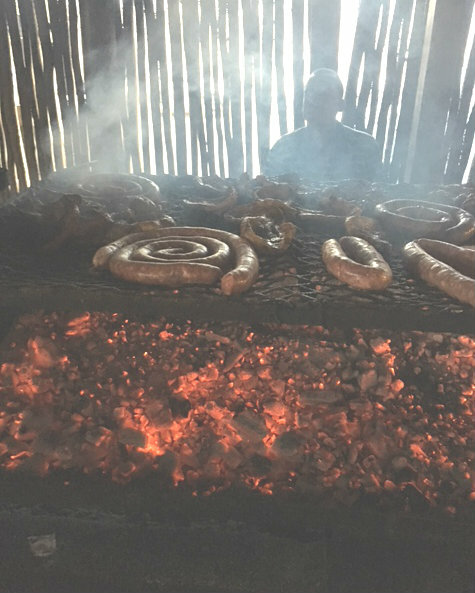 In addition to the lamp chops we also received beef and wors (sausages.) The platters that these meats were served on were the cardboard that formerly housed cases of beer. Mr. Deep at Tintie's. You can see the guy hanging out and tailgating in the background. You can also see the giant quart bottle of beer in this picture. Tinti has cornered the market. And as you can see below some signs say Tintie's and others say Tinti's. I don't know why. Not a great photo because the light is behind them but still had to post a pic of the guys cooking the meat. Pap. It came wrapped in plastic on a Styrofoam plate. So I guess there was sort of a plate. One of our fellow expats walked to Tintie's supermarket and bought a package of serviettes but other than that that one creature comfort we all ate with our hands and without utensils or plates. Following dinner, we stopped at a petrol (gas) station to use the bathrooms. We then headed to our first shebeen, called The Shack. The Shack looked like some one's house as it consisted of various rooms. The first room had a table and couches and seemed to be where the older men were hanging out. The next room had a pool table and seemed to be where the younger men were hanging out. The bar itself was its own room. It wasn't really a bar but rather a room full of coolers like you would see in a grocery store. A guy manned this room which also contained the cash register. How funny I just noticed the guy in the Giants shirt. At this point Mr. Deep became interested in playing pool with the locals. Unfortunately we weren't at The Shack long enough for him to have the chance to play. At the next bar, called the Sanile's Place, he immediately put his money down in order to get next game. It turns out there are pool rules that are very specific to Africa. The Africa bump bump rule means that if you are shooting and fail to connect with your ball (this would be a table scratch in conventional 8-ball rules), your opponent gets a "free" additional shot if he misses his next. If your opponent makes his shot, he still is able to use that free shot if he misses after that. I know what you are thinking. This rule sounds like a rule that was created specifically for the circumstance when a white guy appears in Soweto and wants to play pool. But Ngugi confirmed that bump bump is an actual rule. Mr. Deep did not win but he did make some friends in the process. The guys playing with him wanted to get a photo with him. Even one guy who had a mohawk and seemed more than a little intimidating as he was explaining the rules in a very animated fashion, became Mr. Deep's best bud while we were at Sanile's. Also at this bar, the actual bar was a counter with bars on it. To purchase a drink you had to go to the window and pay, similar to a gas station. Sanile's also had a DJ spinning tunes and lots of people dancing. While there were some women in these bars, I would say 90% of the clientele were men. Probably because women were too busy at home taking care of their kids. One of the woman in our group was a blond woman from Finland she got a lot of attention from the men. Ngugi told us on the bus that one guy at Sanile's offered him 40 head of cattle as a lobola for her. A lobola is a dowry or a price that a man's family gives to a woman's family to obtain the woman as his bride. That is the thing about Africa...one minute you easily forget you are anywhere exotic and the next minute someone is offering 40 head of cattle for a woman. A selfie with Mr. Deep's new friends including guy with mohawk. Oh and I am promised that facial hair will be gone by the end of the year. We then moved on to our final bar called Sakhimzi. Sakhimzi was like any other restaurant or bar that you would find in any city. It had a ton of outside seating and the bar itself was normal meaning you could walk up and order directly without iron bars or having to pass any money through a slot. It was a nice place and we once again secured a long table outside. We met a guy named David and he sat with us and we played a game where he guessed which country we were all from. He didn't do too badly. It turns out he visited Chicago once when he was working as a salesman. 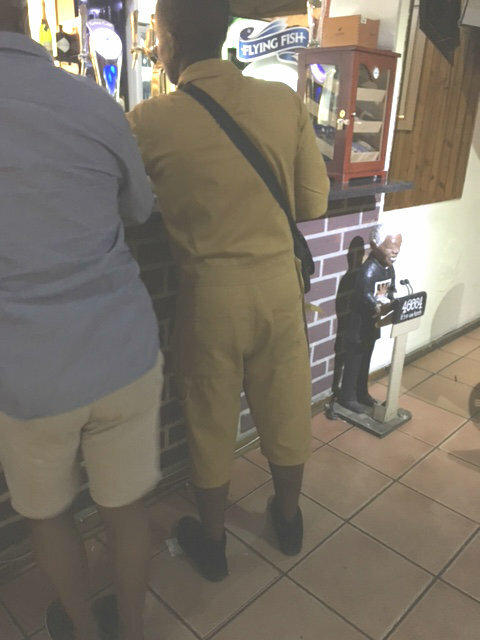 The only thing that was strange about Sakhimzi was the staff were all wearing canvas jumpsuit type uniforms which made them look like they had just parachuted in. It had to be hot and uncomfortable and I clearly missed what about the theme of the bar led to these uniforms. The leader from InterNations named Nkuli with Ngugi, our tour guide. I liked the Internations event. It was well organized and we met some very nice people. This is the first expat group type thing we've done. We have joined meetup events a few times but that's interest based and not expat based.